A 53 year-old female with poorly controlled asthma presents with wheezing, productive cough and a peripheral eosinophilia. A chest radiograph is taken. 2. Given the radiographic findings, what would you consider as an underlying diagnosis? A 47 year-old female presents with ongoing shortness of breath. 1. What is the main abnormality present on the chest radiograph? 1. c) Bronchiectasis. 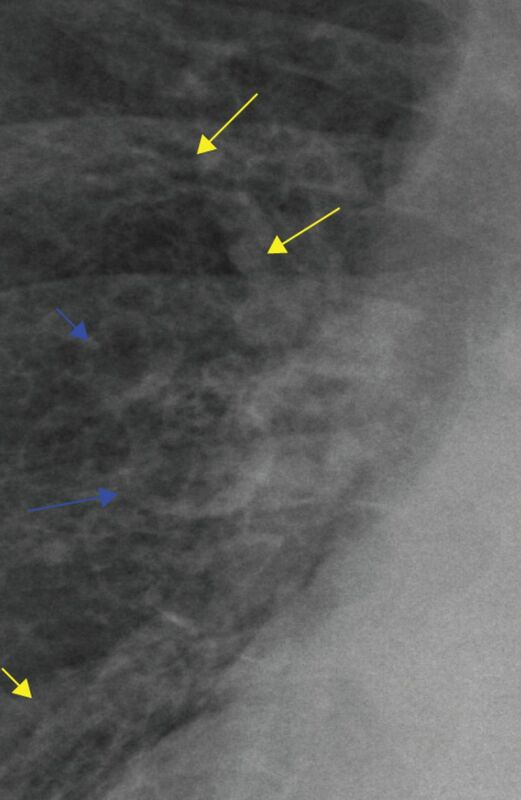 The main abnormality is the presence of thickened non-tapering bronchial walls (yellow arrows on the figure), which can have the appearance of tram lines and clustered walled cystic spaces (blue arrows). These findings are in keeping with bronchiectasis. In this case the distribution is predominantly central. 2. d) Allergic bronchopulmonary aspergillosis (ABPA). The patient had elevated Aspergillus specific IgE levels and peripheral eosinophilia and was diagnosed with ABPA, with confirmation of central bronchiectasis on HRCT imaging. ABPA is encountered in patients with long-standing asthma and also in patients with cystic fibrosis. Clinically, patients have atopic symptoms (especially asthma) and present with recurrent chest infections. They may expectorate orange-coloured mucous plugs. ABPA is the result of hypersensitivity towards Aspergillus spp. that grow within the lumen of the bronchi, without invasion. The hypersensitivity initially causes bronchospasm and bronchial wall oedema, which is IgE mediated. Eventually there is bronchial wall damage with loss of muscle and bronchial wall cartilage resulting in bronchiectasis, typically in a central location. 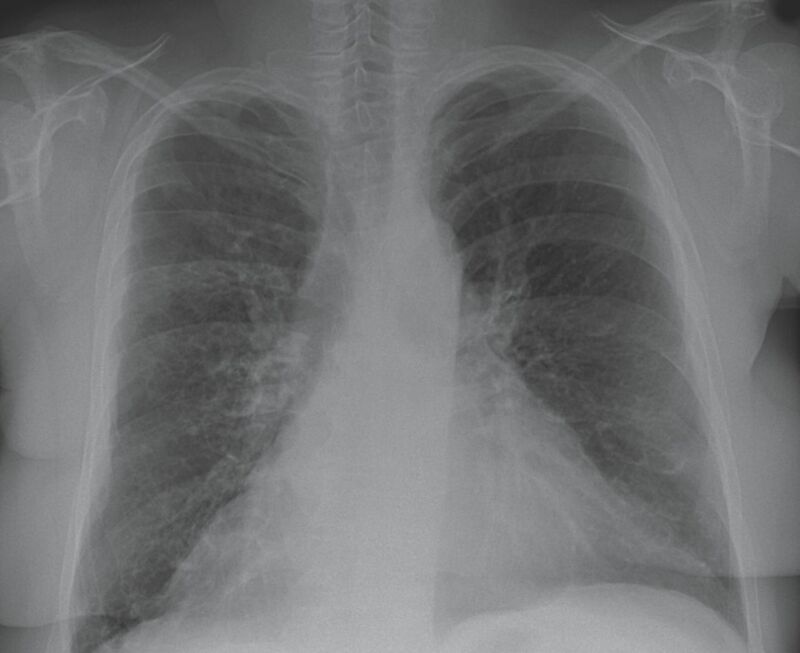 Initial chest radiography findings include the presence of transient patchy areas of consolidation in keeping with eosinophilic pneumonia. Mucoid impaction can result in bronchocele formation and the finger in glove sign. 1. d) Right pneumonectomy. There is opacification of the right hemithorax, a so-called “white-out”. There is associated volume loss with mediastinal shift and tracheal deviation to the ipsilateral side. With a right pleural effusion alone there would either be no mediastinal shift, or if the pleural effusion was large enough there would be a shift to the left. With right lower lobe consolidation the alveoli or air spaces are replaced by fluid or secretions, generally with no change in volume, and therefore a normal sited mediastinum. The main finding here is a mediastinal shift to the right with marked loss of volume in the right hemithorax. The differential diagnosis would include total lung collapse or post-pneumonectomy. 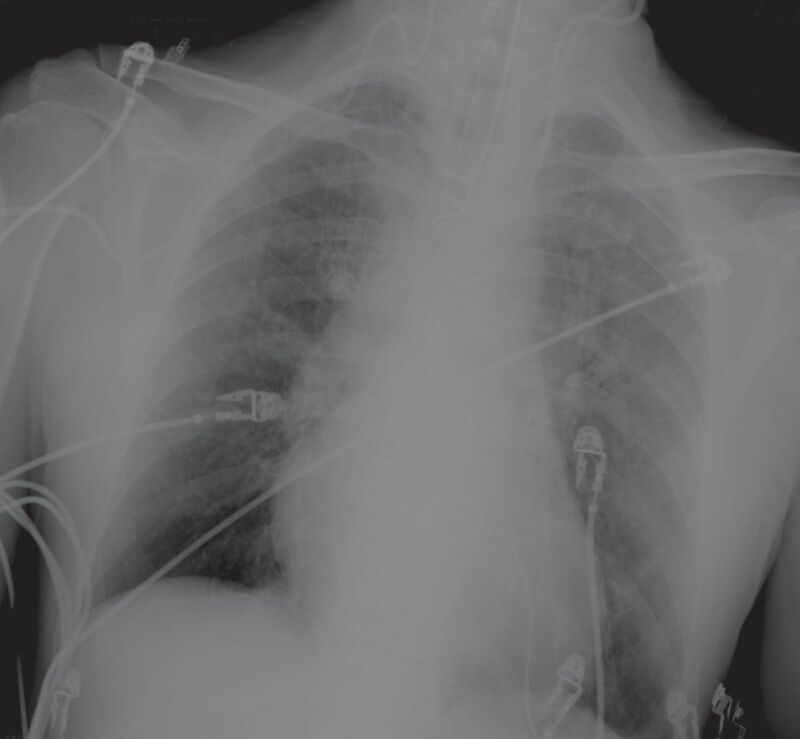 The evidence of past thoracic surgery, with presence of surgical sutures and the absence of the right fifth rib due to previous thoracotomy, is the key in this case in keeping with the prior pneumonectomy. If there was a bronchopleural fistula present you would expect to see an air fluid level in the right hemithorax on this erect film. 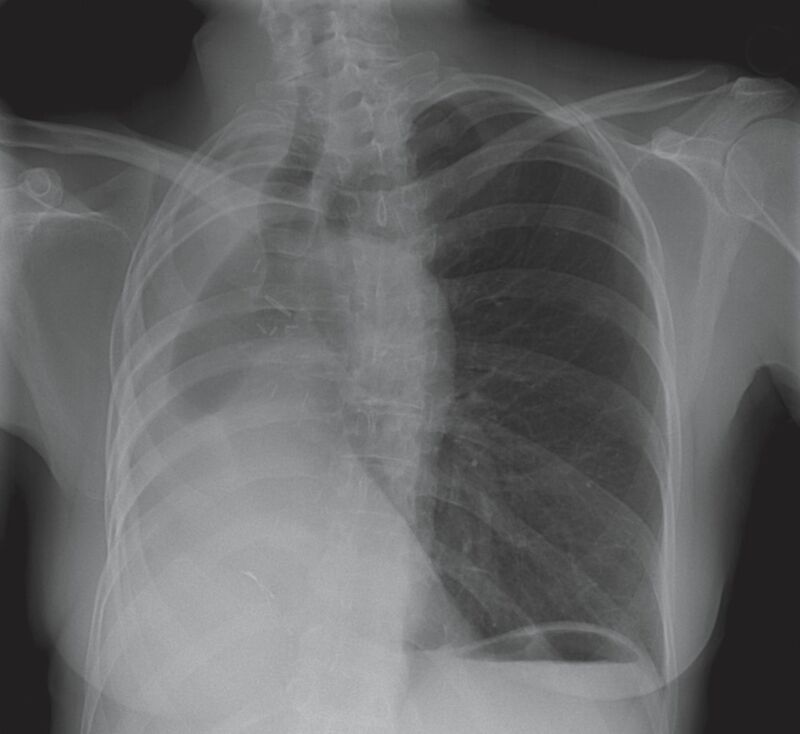 There is air present medially due to herniation of the left upper lobe into the right hemithorax, but no air fluid level. A 43 year-old female is admitted with chest pain and a productive cough. 1. What is the best description of the chest radiograph appearances? A 42 year-old male is transferred to the intensive care unit following surgery. 1. What is the main urgent abnormality? 1. b) Situs inversus. 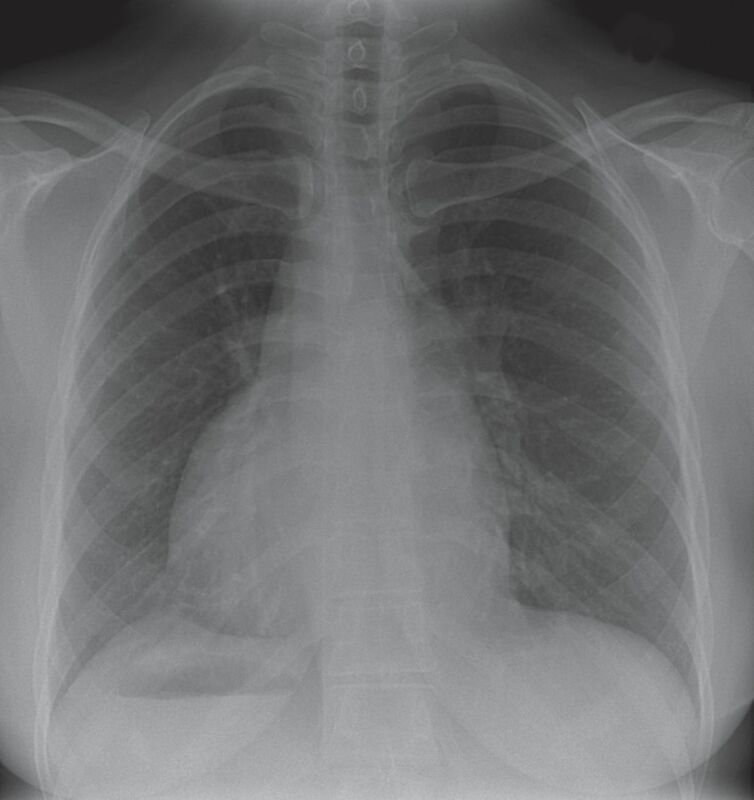 There is dextrocardia; in addition, note the presence of the stomach bubble in the right upper quadrant. Both of these findings are in keeping with situs inversus. Situs inversus is a congenital condition in which the major visceral organs are reversed or “mirrored” from their normal position. In situs solitus the abdominal organs are in the usual left/right locations. On a chest radiograph the next finding to look for is to see if there is any evidence of bronchiectasis. There is no chest radiography evidence of bronchiectasis in this case. Approximately a quarter of patients with situs inversus have Kartagener’s syndrome, which is characterised by the triad of situs inversus, sinusitis and bronchiectasis. In this condition there is primary ciliary dyskinesia and hence abnormal clearance of mucus from the airways renders patients susceptible to recurrent infections and subsequent bronchiectasis. In dextrapostion of the heart an anatomically correct heart is displaced to the right hemithorax. When dextrapostion is present the aortic knuckle is located in its normal position to the left of the trachea. In this case it is on the right side. Causes of dextraposition of the heart include chest wall deformities, post-pneumonectomy or lobectomy, hypoplastic right lung and eventration of the diaphragm. 1. c) Iatrogenic abnormality. The main abnormality that the clinical team needs to be aware of is that there is a right internal jugular line, which is malpositioned and probably ascending via the internal jugular vein. Its tip cannot be visualised on this film. The best position for the central line tip is in the superior vena cava or brachiocephalic vein. There are two left-sided internal jugular lines that are appropriately positioned. The tip of the endotracheal tube is difficult to determine on this radiograph due to technical factors, but this was appropriately sited when the image settings were altered. Note the ECG monitoring leads as well as the prosthetic mitral valve, sternotomy wires and pericardial drain. The importance of checking all tubes and lines cannot be overstated.